As the seasons begin to change you might be like us and are anticipating the 2018 Fall and Winter New York Fashion Week. 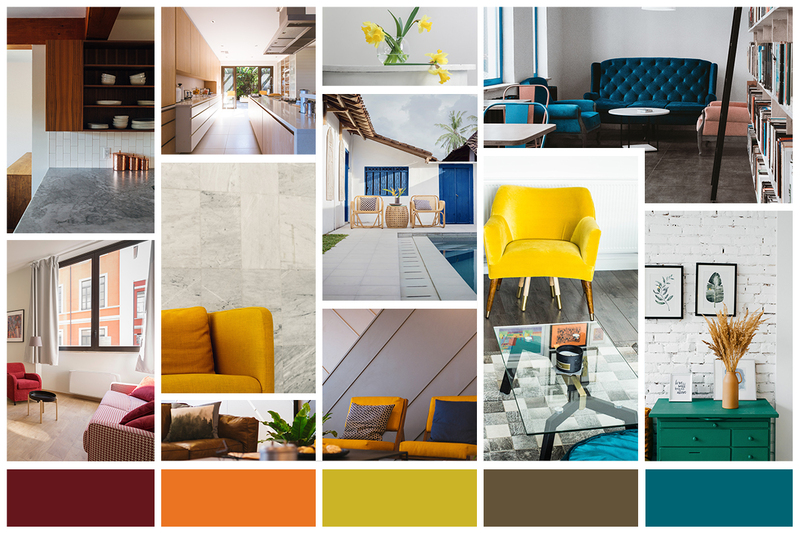 In preparation for this week, Pantone has released its 2018 Color Trend report with swatches of some of this year's biggest color trends. These are the colors that will define the fashion, design, and look of the rest of 2018. The report included great colors that are different to be sure! Bright reds, deep blues, and some light violet shades join the traditional “fall” colors like orange and olive. As these fashion trends make their way to market this season you might be thinking about ways to incorporate them into your home. Don’t worry about painting a wall or redoing your floors, simple accent pieces are an effective way to spruce up your home with some seasonal color without breaking the bank or having to knock out a wall. Large furniture pieces can be a good foundation for seasonal color in most rooms. A velvet sofa in Pantone’s “Red Pear” or “Quetzal Green” is an easy way to bring these colors into your home. If you have other furniture in the room you can find these sofas in modern or more classic styles so they are an extremely flexible no matter what style you have. Additionally, accent chairs with highlight colors can bring seasonal colors into a room where you might be short on space or already have a softer color centerpiece. A pair of chairs in “Ultra Violet” or “Nebulas Blue” are fantastic highlights and are available in a wide array of styles. If you already have more muted colors in your home, accents such as pillows, rugs, and plants in some of the lighter fall colors such as “Russet Orange” or “Ceylon Yellow” can bring some warmth into what might be a frigid modern space. A great option for the kitchen you might consider are ceramics. From bowls to serving dishes, even storage canisters, you can find a variety of colors accents and styles to choose from. If you want to take on a DIY project, you might try repainting existing wood furniture. You could pick muted or bright colors depending on the room and your use of the furniture. If you are hesitant to sand and repaint your existing furniture, thrift stores can be a great place to find some “test” projects. End tables, coffee tables, lamp stands, and bureaus are just a few of the pieces you could try repainting. Some people even choose to combine shades using light colors to contrast darker colors. Roll up your sleeves and get creative! We hope that as you enjoy the New York Fashion week that you are inspired to bring some of the same colors into your home this season!